"I hope to teach others ... it's important to see past appearances"
Editor's note: America's 300 million-plus people are declaring their identity in the 2010 Census this year. This piece is part of a special series on CNN.com in which people describe how they see their own identity. David Paul Strohecker is a doctoral student at the University of Maryland, College Park. (CNN) -- We are often asked to declare our identity for documents, applications, bank loans and even social networking sites. But how much of our identity is lost when we select "female," "African-American" or "Muslim?" I think much of my own identity is lost when I fill in those boxes. I am technically a white, male, heterosexual, Christian, upper-class Ph.D. student. But I am more than meets the eye. 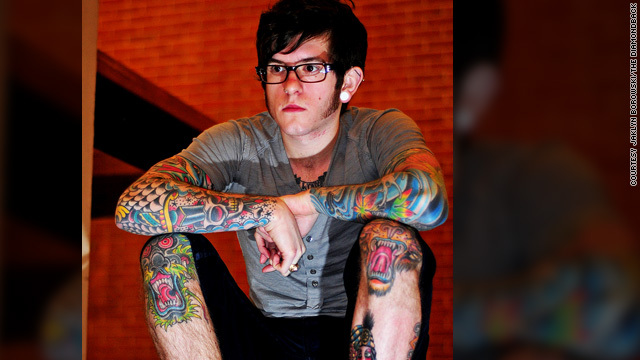 I'm covered in tattoos and piercings, and this often leads to assumptions about my character. "Is he a drug addict? Is he a skinhead? Does he play music for a band?" I am none of these things. The lesson I hope to teach others through my life is that it's important to see past appearances. My sociopolitical views are a large part of my identity, and I incorporate these into what I wear; whether it's T-shirts emblazoned with the images of activists whom I admire or deliberately manipulating my demeanor to reflect the "professorial" role I assume in the classroom, I am continually aware that others are reading my presentation as a measure of my character. And it is to this end that I deliberately try to throw people off. I hope to debunk some of the myths surrounding tattoos and piercings. And I know that everyone who interacts with me is left wondering how someone so "deviant-looking" can be kind, courteous and hospitable. My body is also a billboard for my life, and my tattoos tell the story of my identity. My earliest tattoos were direct quotes and Bible verses and captured my identity as an outspoken social-justice advocate. I began to display my political views more directly in later tattoos. I have the "female" sign behind my left ear to reflect my commitment to feminism and women everywhere; I have the Human Rights Campaign logo behind my right ear to reflect my commitment to LGBT struggles. The tattoos on my arms capture my commitment to "faith," "family" and "mom and dad." I also have a bald eagle on my forearm to reflect my commitment to making this country a better place and a skull wearing a graduation cap to reflect my lifelong commitment to teaching. I know that my appearance is misleading, and I know that many people would disagree with what I see as efficacious inscriptions. But one thing is for certain: I will not blend in with the crowd. I will be noticed, for better or worse. The opinions expressed in this commentary are solely those of David Paul Strohecker.